Sets and Recipes: How does exercise reduce stress? You've probably heard that exercise reduces stress, but how? To understand how this works, you need a basic understanding of the nervous system. 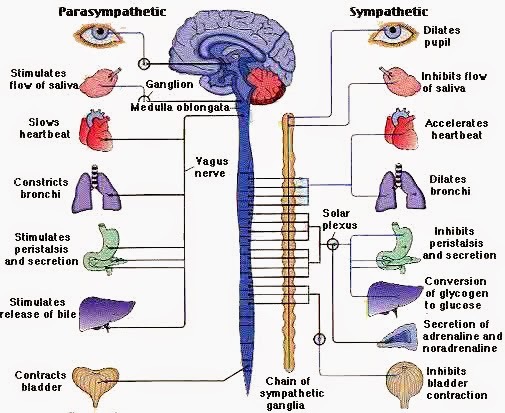 The nervous system is divided into the parasympathetic nervous system (PSNS), sympathetic nervous system (SNS), and enteric system. Each of these systems has a role in controlling bodily functions, and they are active at all times, but depending on the situation, one will take over. PSNS is responsible for "rest and digest." When the body is at rest (when your resting heart rate is below 100 beats per minute), the body can focus on digestion, feeding, urination, and the secretion of norepinephrine (also known as noradrenaline). SNS is responsible for "fight or flight." When the body is under stress (heart rate is above 100bpm), the body focuses on directing blood flow to the muscles, dilating the pupils, and secreting epinephrine (also known as adrenaline). Enteric system is responsible for controlling reflexes. Stress comes in many varieties, but they are not all bad! Stress can be positive when the right amount allows us to increase alertness, precision, strength, etc. to achieve a particular goal. For example, the right amount of stress right before delivering a presentation will keep you alert and on task. Positive stress improves our performance and will allow us to return to a relaxed state after the stressor has been removed. Stress is negative when it too much stress prevents us from achieving a particular goal. For example, too much stress right before giving a presentation will cause you to have trouble breathing normally, speaking clearly, etc. Negative stress will decrease performance, but still allows us to return to a relaxed state after the stressor has been removed. Heart rate remains elevated, preventing relaxation or sleep. Digestion is slowed, causing constipation. Bile production is slowed, reducing the absorption of vitamins. The hormone cortisol is produced, causing cravings, increased appetite, increased fat deposits, and suppressed immune function. Exercise is considered a good form of stress. It places a positive stress on the body that, through training (a regular exercise routine), the body learns to manage. The regular secretion of adrenaline will train the body to produce the “right” amount of adrenaline, and allows the body to a resting state faster. Epinephrine and norepinephrine are more effective at rest in regular exercisers than in non-exercisers. Any form of regular exercise (cardio, resistance training, yoga, sports, etc.) is shown to have a positive effect on stress management!